There are many people who prefer drinking cold brew coffee instead of hot brew. Coffee shops today also offer cold brew coffee in their menu. However, they are more expensive compared to hot-brewed coffee. Some may also think that cold brew coffee and iced coffee are the same, but they are not. Iced coffee is made by simply adding ice cubes to hot-brewed coffee. It’s easy to make and there’s no need to use a coffee maker. Cold brew coffee on the other hand, is made from slowly steeping cold water and coffee for 16 to 24 hours. It is smooth, and low in acidity, but you will need a lot of patience in making one, as well as a cold brew coffee maker. Some people prefer drinking cold brew coffee because it’s less acidic and more stomach-friendly. Also, cold-brewed coffee can last up to two weeks, therefore, you can make a huge batch at once. When it comes to the brewing process, there are two important factors to control which are time and temperature. The cold brew method needs a long brewing time because it does not use high temperature. This is why cold brew coffee has smooth and mellow flavor. When it comes to the grounds-to-water ratio and caffeine content, cold brew coffee is strong, but it does not taste bitter, which is another reason why some people like it. Can be used with regular mouth Ball Sip & Straw lids Ball plastic storage caps, or any regular mouth 2-pc. caps for drink storage Made in the USA of high quality glass. There are many ways to make cold brew coffee which are, by using a French press, a mason jar, or an Aero Press. But if you want to come up with the best tasting cold brew coffee, using a cold brew coffee maker is the best choice. 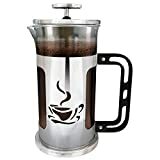 French Press: If you own a French press at home, you will be able to make cold brew coffee through immersion. However, French press coffee makers are not big enough to make more than a few cups at a time. You will also need to filter your coffee after the brewing process. Mason Jar: This is another equipment you can use to make cold brew coffee through immersion method. Simply put some coffee grounds into the water in the jar and wait for it to be brewed. Aero Press: This is a portable and easy to use coffee maker and you can use it to make cold brew coffee. But it can become messy at first and you won’t be able to make a large batch. Cold Brew Coffee Maker: If you’re serious about making cold brew coffee, it’s better to invest in a good quality cold brew coffee maker or dripper. Cold brewers are not fully automatic, meaning, you will still have fun in making your own cold brew coffee. It is also more convenient and consistent. If you want to try brewing cold coffee at home, it’s better to have a good quality cold brew coffee maker. But for you to choose the best one, there are some things you need to consider such as the size, filters, and functions. Size: This will depend on how much coffee you will be brewing. 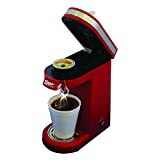 There are some cold coffee brewers which are large, best for brewing great volumes of coffee concentrate. However, large ones are difficult to store and they take up a lot of space in the fridge. 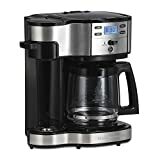 If you won’t be brewing that much coffee, or if you have a limited space, try to find a brewer that is shorter and slimmer, or all-in-one units that combine the brewer and the carafe together. Filters: There are cold brew coffee makers that uses paper filters, while others are made of metal. Paper filters can give you a sediment-free coffee extraction, but it can be a messy clean up after. Brewers with metal filters are much easier to clean but it can lead to having extra sediment in your coffee. The choice will depend on your preference. Functions: Cold brew coffee makers have different functions depending on the model you’ll be choosing. There are some which are very easy to use while some are very technical and will require an understanding of grind consistency, blooming techniques, and agitation. This will depend on your preference, but since you’ll be waiting for about 24 hours, maybe it’s best to choose one that is simple to use. There are many cold brew coffee makers being sold in the market today and choosing one can be challenging. To help you out, here are some of our top picks that you might like. This is a very unique and beautiful looking coffee maker. It includes a carved wooden stand which holds the four glass components. It’s impressive to watch the brewing process in this coffee maker because once the coffee is extracted, it will drip through a spiral glass tube and collect in a globe shaped serving carafe. This coffee maker has interesting tools for a great cold brew process such as the patented Rainmaker coffee extraction lid. This lid helps distribute the water over the grounds evenly to ensure complete saturation while avoiding over-extraction and bitterness. Its design does not take up much space, therefore, you can easily store it or have it on your kitchen counter. This cold brewer uses a two-part wool and paper filter to ensure a sediment free concentrate. It has a thick wool fiber that acts as both grounds guard and filtration device. It is durable, easy to assemble and take apart, and easy to clean as well. This is a popular choice among the cold brewers on the market. Though it may look like it lacks some design, it won’t fail you when it comes to its function and brew quality. It uses both wool and paper filter, ensuring less amount of sediment and grit in the final extraction. There are indeed many ways to be able to drink a cup of cold brew coffee. But for coffee lovers, investing in a good quality cold brew coffee maker to make cold brew coffee at home is the best way to enjoy it.